The device, called the Cooling Cure, aims to lower a newborn’s temperature by about 6 degrees F for three days, a treatment that has been shown to protect the child from brain damage if administered shortly after a loss of oxygen has occurred. Common causes of this deficiency are knotting of the umbilical cord or a problem with the mother’s placenta during a difficult birth. In developing regions, untrained delivery, anemia and malnutrition during pregnancy can also contribute to oxygen deprivation. In a recent issue of the journal Medical Devices: Evidence and Research, the biomedical engineering student inventors and their medical advisors reported successful animal testing of the Cooling Cure prototype. The device is made of a clay pot, a plastic-lined burlap basket, sand, instant ice-pack powder, temperature sensors, a microprocessor and two AAA batteries. To activate it, just add water. The device could help curtail a serious health problem called hypoxic ischemic encephalopathy, which is triggered by oxygen deficiency in the brain. Globally, more than half of the newborns with a severe form of this condition die, and many of the survivors are diagnosed with cerebral palsy or other brain disorders. The problem is particularly acute in impoverished regions where pregnant women do not have easy access to medical specialists or high-tech hospital equipment. The inventors say Cooling Cure could address this issue. “The students came up with a neat device that’s easy for non-medical people to use. It’s inexpensive and user-friendly,” said Michael V. Johnston, a Johns Hopkins School of Medicine pediatric neurology professor who advised the undergraduate team. Johnston also is chief medical officer and executive vice president of the Kennedy Krieger Institute, an internationally recognized center in Baltimore that helps children and adolescents with disorders of the brain, spinal cord and musculoskeletal systems. For the past 25 years, Johnston has been studying ways to protect a newborn’s brain, including the use of costly hospital cooling units that keep brain cells from dying after an oxygen deficiency. Several years ago, while visiting Egypt, he learned that local doctors were using window fans or chilled water bottles in an inadequate effort to treat oxygen-deprived babies. When he returned to Baltimore, Johnston and Ryan Lee, a pediatric neurologist and postdoctoral fellow at Kennedy Krieger, discussed the problem with Robert Allen, a Johns Hopkins associate research professor in a biomedical engineering program that requires undergraduates to design and build devices to solve pressing medical problems. 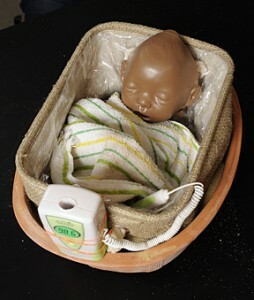 Allen suggested that Johnston and Lee present the baby-cooling dilemma to biomedical engineering students in the school’s Center for Bioengineering Innovation and Design. 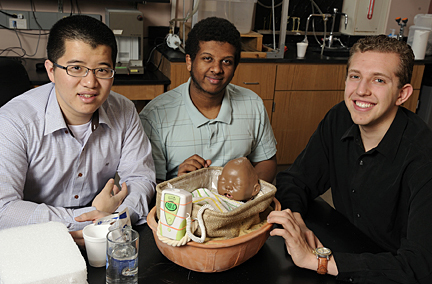 Last May, at a student invention showcase organized by the university’s Department of Biomedical Engineering, the Cooling Cure team presented its prototype, designed for a full-term newborn weighing up to nine pounds and measuring up to 18 inches in length. The team won the Linda Trinh Memorial Award, which recognized Cooling Cure as an innovative idea for a global health project. In August two of the student inventors were chosen to visit medical centers in India for a two-week trip sponsored by a group called Medical and Educational Perspectives. The group has also offered modest financial support to advance the Cooling Cure design project. Working with the Johns Hopkins Technology Transfer staff, the students and their faculty advisors have obtained a provisional patent covering the low-cost baby-cooling unit. In the near future, the student inventors hope to link up with an international medical aid group and begin human clinical trials in a developing region. John Kim was lead author of the Medical Devices: Evidence and Research study. The co-authors—all Johns Hopkins student inventors and faculty advisors—were Buchbinder, Ammanual, Robert Kim, Erika Moore, Neil O’Donnell, Jennifer K. Lee, Ewa Kulikowicz, Soumyadipta Acharya, Robert H. Allen, Ryan W. Lee and Michael V. Johnston. The article can be viewed at http://www.dovepress.com/articles.php?article_id=11849.